Pure Badger Shaving Brush (P1020B). This shaving brush is ideal for beginners. It has been made to give you a close, comfortable, enjoyable shave. It has been made to Taylor’s highest standards using the softest badger hair. The bristles are made to last and will remain soft for many years to come. The design is finished in imitation ivory. 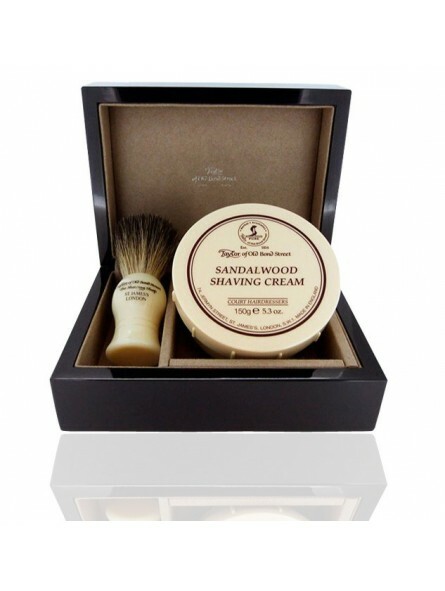 Sandalwood Shaving Cream for Sensitive Skin. Taylor of Old Bond Street Sandalwood shaving cream bowl. 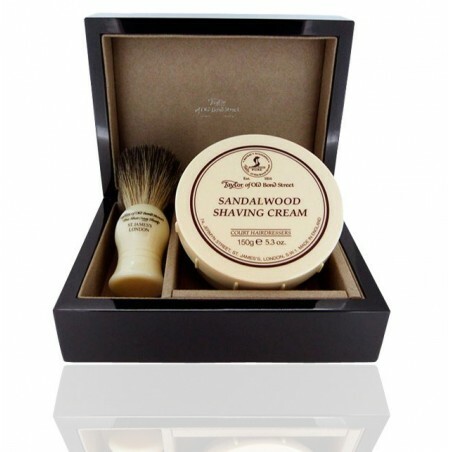 A luxury Shaving Cream that creates a uniquely smooth and creamy lather whilst protecting and moisturising the skin to give a better shave. It has a bold scent containing elements of cedar, rosemary and lavender that is elegant and sophisticated. It will help to keep your face free of nicks and cuts.